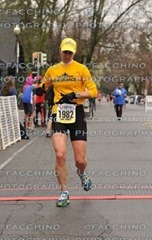 This 1/2 Marathon is a great prep for our Napa Marathon next month. Anna, Ariel and Grammie are also looking forward to racing shorter distances. Grammie and Papa are visiting from San Diego. We all head to Davis in a heavy downpour. We've got the rain jackets and are prepared for the worst. As the race is about to start, the rain has stopped and the temperature is great. Robin and I line up first and give our gear to Robin's dad, Jerry. Jan and Anna will run next in the 5k. Later Ariel will run the 1/2mi race. Go! Unfortunately my Garmin didn't start so my stopwatch is all I've got. Immediately I realize we're both going to be too warm. We were planning for being drenched so wore rash-guards (very warm) and gloves. But it's dry and we're heating up. We stay with the 1:30 group. This has been Robin's goal although we really didn't plan it out well. 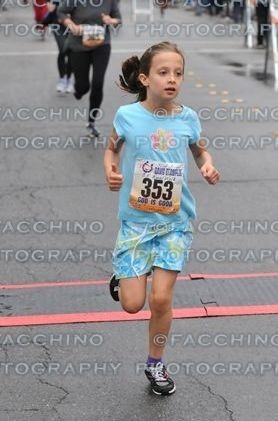 My goal is go under 1:30 but I don't know how much. 1mi: We're on pace, but I think it's a little more difficult then it should be for Robin. 2mi: Robin is falling back a little and I'm trying to push forward ahead of the group. 3mi: I want to run a 1:28 (6:43 pace). I'm slowly working my way up. About 25 secs behind. We round a neighborhood park and I see Robin off the back of her group and realize 1:30 wasn't a good pace. Should have been 1:35. I yell back to Robin that she's doing great and to think about Napa (so that she doesn't hurt herself). 4mi: Now we head a mile down E. Covell Blvd. I'm more than 30 secs off of 1:28 pace so really trying to pick it up while also being careful not to hurt my left hamstring. Just like the Turkey Trot here, I'm having to focus on "pulling through" my right leg using my abs. 5mi: That mile went well. Now through the neighborhoods again and then north to the golf course. With the wind behind us I'm able to get a little closer to the 1:28 pace. 6mi: 6:47 average. 24 secs behind 1:28. Now East along the golf course on gravel with a side wind. 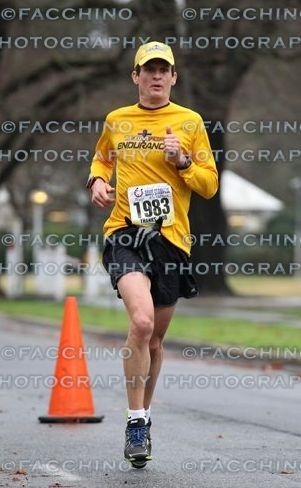 I work hard to bridge the gap and get in a runner's draft. Then I leap-frog up to the next runner. Also trying to pick the straightest lines along the gravel road. I'm keeping pace but still behind 1:28. 7mi: Now we turn south into the wind. I draft another guy for a while and then he drops back to draft off of me. Working together helps keep us both motivated to stay the pace. Now we take the serpentine path under Covell Blvd, where I dropped my gel last year and strained my hamstring picking it up. I'm careful to eat and drink without dropping anything this time. 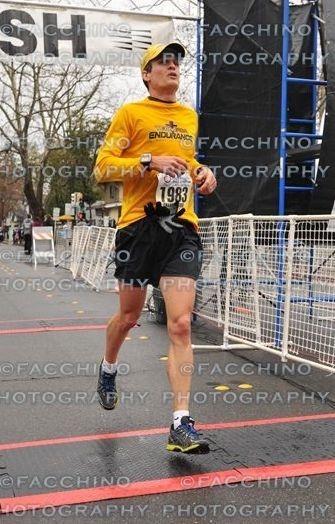 8mi: With the head-wind, I didn't gain on 1:28 pace that last mile. But now it's protected and I gotta work to move up. I keep my eye on runners ahead.. working up to them and passing. We go around another park and soon we'll hit the overpass where my hamstring pulled last time. 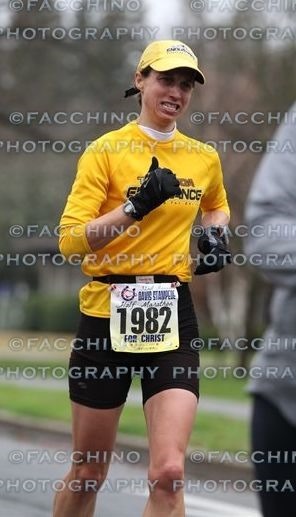 9mi: 20 secs behind. That was a good effort. Now up and over the pedestrian bridge. I'm tired and legs are sore. I'm very attentive to my hamstrings. Trying to push but not injure. Down the ramp.. going down is even more hazardous to a hamstring. Onto the short out-n-back section.. careful on the sharp turn. 10mi: 6:46 average. 30 secs behind. 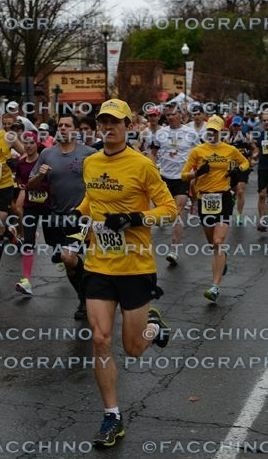 The hamstring is hanging in there. I'm looking forward to being done. This is where I had to start walking last year. It's tender but I'm still going fast… need to knock off 10secs a mile. I've been thanking God along the way and realizing how dependent I am on Him in everything. Nothing is a sure thing. But with Him I know the outcome is best. I just have to follow His lead rather than making it all about me. 12mi: Here we go.. final mile.. under the highway, under the train tracks, across the parking lot and now only 1 turn to go! I think I can make 1:28. I see a female coach running to cheer on her athlete finishing the 10k. The coach is jumping, cheering, full of energy, trying to lead her agonizing athlete into the final turn. I don't know if making it look so easy is helping much. 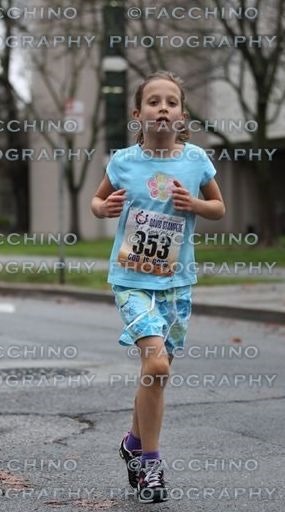 Her athlete is in pain, but hopefully will keep it up to the finish. 13mi: There it is! Thanks God for helping me the whole way. 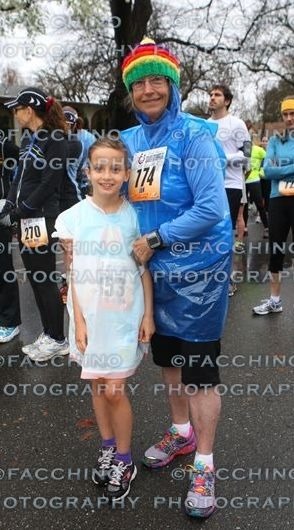 I finish in 1:28:14 (6:44) and immediately see Anna and Grammie waiting for me. They did great in the 5k! I pray for Robin's final miles and wait to see how she perseveres. 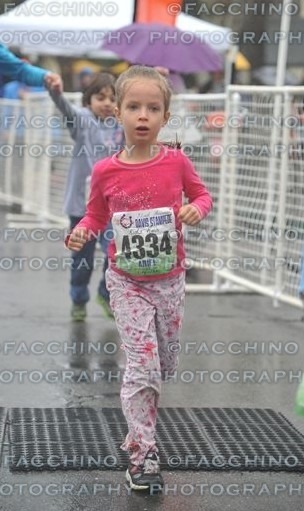 I know it's going to be hard because the first 3 miles were too fast, but I also know she'll fight to the end. God is good! It’s been a fun weekend with my parents visiting and the start of the Olympics! My Mom and I just celebrated our birthdays together on Friday. We are both aging up today…she is moving up to the 75-79 category and I’m moving up to the 40-44 category. I felt so easy going about aging but doubts are creeping in. I am amped to try and go for a PR and run sub 1:30 today. I’ve put in the distance training and speed work…but probably not enough speed work. It has been raining like crazy but it seems like we are going to get a break so cannot use that as an excuse for missing the goal. Anna and my Mom are running the 5K together & Ariel is hanging out with Papa until her 1/2 mi race. Troy and I say goodbye to them and get on the starting line. There are pacers here and I ask Troy if I should try and stay with the 1:30 group. He says yes. As the countdown begins, Troy’s Garmin has yet start up and be ready. I tell him to get his regular watch ready. Ready, set, go! Right off the line the pace feels fast but I try to relax and tuck in behind the 1:30 group. Troy is with me and since his goal is to go faster than me I ask him why. 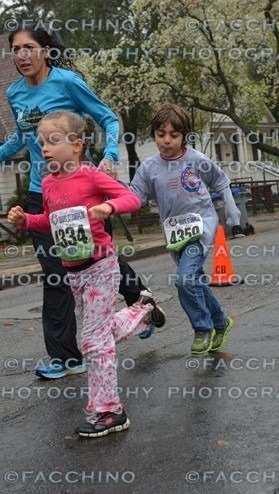 With a smile he says “Anna told me to make sure you’re okay for the first mile.” Aww, what a sweet girl! Mile 1 is 6:39. Troy takes off and I hang on to the pacer. I feel way over my head but I push anyway hoping to just survive! Thank God that there is no rain! I’m getting really hot in my long FCA top with the tight rash guard underneath. We were expecting the rain and the chill that comes with being wet but that isn't the case. Mile 2 is 6:54. Wow, this is tough! I feel like I’m overheating and my energy is burning up quick! I don’t think I can keep this up but I’m determined to go after my goal! Mile 3 is 6:53. I decide to back off the pace…it’s just too quick and I’m not even close to the halfway point. I’m feeling upset for not being able to do it and for not starting out more conservatively…such a contradiction. 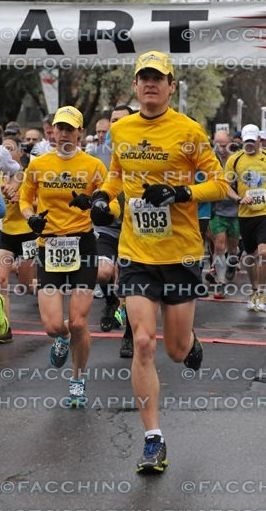 If I can just stay ahead of the 1:35 pace group, that would be good! Mile 4 is 7:14. Hanging in there but already feeling wasted. Maybe I’m really feeling my age now. Maybe my best years are behind me. Mile 5 is 7:20. More people are passing me and I’m getting more frustrated. But I’m still ahead of the 1:35 group! Mile 6 is is 7:15. We turn off the road onto a dirt path that runs behind a golf course. It’s uneven and hard for me to keep a good rhythm. I hear a bunch of foot steps behind me and dread the worst…they’ve caught me! Sure enough, the 1:35 pacer flies by and I cannot react. Mile 7 is 7:48. I can feel myself spiraling into a state of negativity. All I can think is this stinks! I take a Hammer gel. Mile 8 is 8:05. God reminds me that I’m wearing my FCA gear and that I’m competing for Him. All I’ve been thinking about is myself. I begin to pray and cry out to Him in my head. He reminds me that I tell Ariel to say “CAN” instead of can’t. I CAN! I feel my attitude turning around and I have more energy! 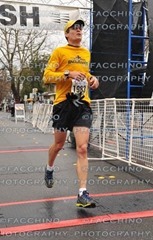 I start pulling away from some runners that came up on me. Mile 9 is 7:24. Thank you Jesus for helping me get going again through Your Encouragement and Power! I feel more relaxed and optimistic that anything can happen! I make it to the only hill on the course, the overpass across 80. My pace slows down but I keep looking to Him and I am joyful. Mile 10 is 7:50. 3 more miles! I CAN do this with the Lord! At the next Aid Station, the volunteers are not holding out cups so I grab one off a table. It’s empty and too late to grab again unless I want to turn around and go back. No way, I want to keep moving forward. I feel the frustration and anger flare up in an instant. Lord, please help me keep focused on you! Mile 11 is 7:26. Thank you Jesus! Almost done. I’m fighting my flesh to keep looking to the Lord. I CAN do this! Mile 12 is 7:40. I’m hurting and my legs are really tight. I CAN with You Lord, I CAN! I see the last aid station and call out for Gatorade. No one steps forward until I pass by. Again, the frustration hits but I look right back at Jesus. The finish line seems so far away but I push as hard as I can. Mile 13 is 7:46. I turn the corner and look for my family. I see Troy and smile and he says “great smile”. I cross the line and am so relieved it’s over! Wow, that was hard physically and emotionally! I finish and thank Jesus for helping me!